I had my chemo treatment yesterday. The good news is that I only have four left. I had 16 in total, four harsh ones, and twelve of these lighter ones. I will be done on February 21. Of course this doesn't mean that on February 22 I'll be back to normal, but at least I should start on the road to feeling better. So one of the side effects of this particular chemo drug I'm on now is insomnia. I suffered through it until the doctor gave me a sleeping pill called Restoril (temazepam). I took it the last 2 times and it worked like a charm. Last night, not so much. This brings me to "The Highwayman." This is one of my most favorite poems. I first encountered it in a collection of poetry for children, and my mom read it to me more than once until I took over reading it to myself. For one thing the poem is loaded with flowing metaphors, and other figurative language. But for another thing, it is one of the most beautiful historical romantic poems I've ever read. I had copied the first stanza out last year when I was teaching 6th graders about metaphors. They all mostly rolled their eyes because not only do they "hate" to read, but they "hate" poetry, and they "hate" history. They're 6th graders after all. I showed the lines to this year's class, and got pretty much the same reaction. Once I'd finished it I immediately thought it would make a good story. A short story most likely. Well, last night as I couldn't sleep I envisioned part of it into a story. See, the highwayman in the poem is in love with the daughter of the innkeeper....but the stable boy is jealous and reports their scheduled clandestine meeting. So, I got to thinking, what if the highwayman wasn't really in love with the innkeeper's daughter, and hooked up with the stable boy instead? Insomnia gave me the first scene between them, as well as a backstory for the stable boy. Of course, insomnia gave me a bunch of Purple Dawn and inspiration for The King's Son....but my all-encompassing fatigue takes all of insomnia's inspiration away. Thank god for notebooks! I know that one day I'll be back to writing. And this story may see the light of day yet! Love it. :D I've written that scenario too. 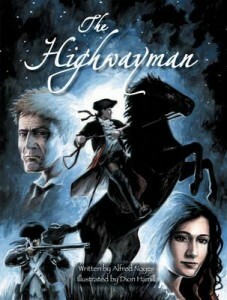 The highwayman and ostler Jem just beg to be slashed, don't they? I hope your insomnia is creative rather than fatiguing. The latter kind is the pits. Good luck. It's a perfect storm! And there are infinite possibilities, so even if five people wrote it, it would come out differently each time!